India, 15 August 2017, Cyber City News – To celebrate and promote the 70th Independence, Ingenious e-Brain has come up with a scheme “Invent India, Develop India” where inventors can patent their innovations at a much lesser price as compared to that of industry standard price. Ingenious is expanding its offerings for inventors who do not want to lose the value of their innovation. 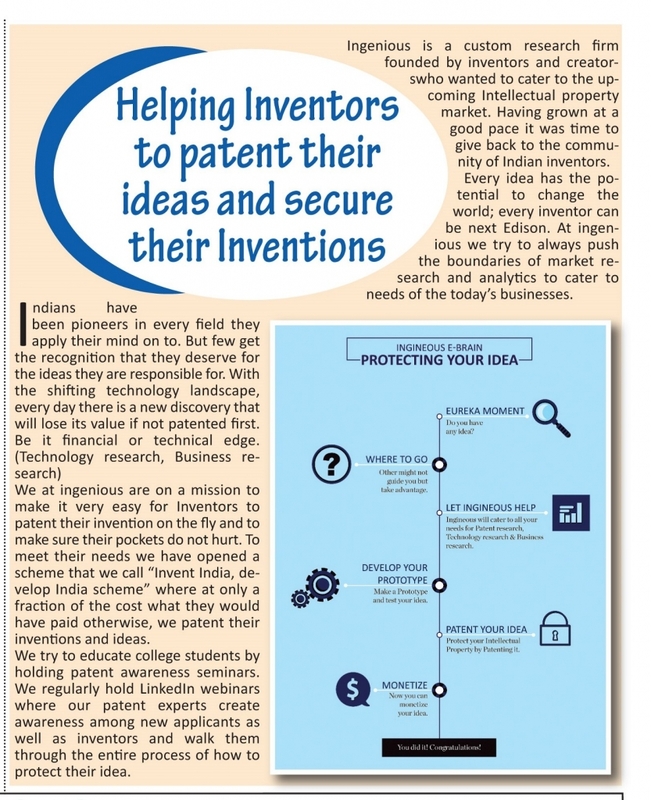 To meet their needs and make sure their pockets don’t hit much we have called for our much owned theme “Invent India, Develop India” to patent the ideas and inventions. Company Director Dr. Deepti Tayal says, “As a company we would like to give back to innovators, the makers and start-ups, so that their idea is protected”. This particular standard scheme currently is being offered in India to celebrate the 70th independence anniversary of the country. Ingenious e-Brain Solutions provides high-quality, customized and cost-effective Intellectual Property Research, Business Research and Market Research solutions to industry leaders, law firms and innovative companies across the globe. Innovation, knowledge and transparency form the basis of our company’s mission and vision. Along with cost benefits, we provide highest quality patent search results ensuring full-proof confidentiality and security. Since our inception, we have conducted patent studies covering over 100 jurisdictions. We are an ISO certified company with offices in India and USA.